This website covers all aspects of the rich history of rowing, as a sport, culture phenomena, a life style, and a necessary element to keep your wit and stay sane. The trophy for the men’s race currently records the winners of the previous 164 races. 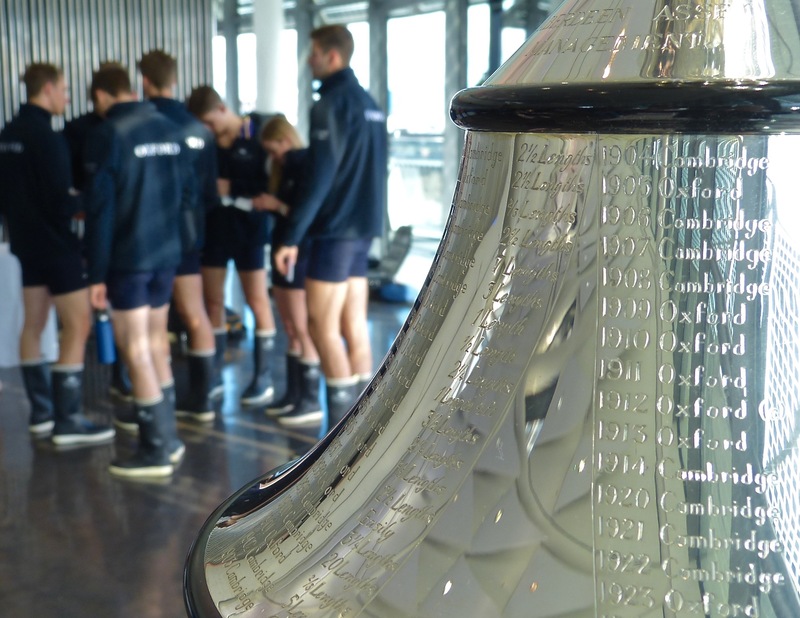 In the background is some of the Oxford Crew that hope to be the 165th name added following the race on 7 April 2019. Tim Koch witnesses the annual attempt to tip the scales. The lycra one-piece (‘unisuit’) is not the most flattering of garments, even when it is clinging to the contours of the athletic, fit and toned. Accessorising it with rubber boots does little to help. 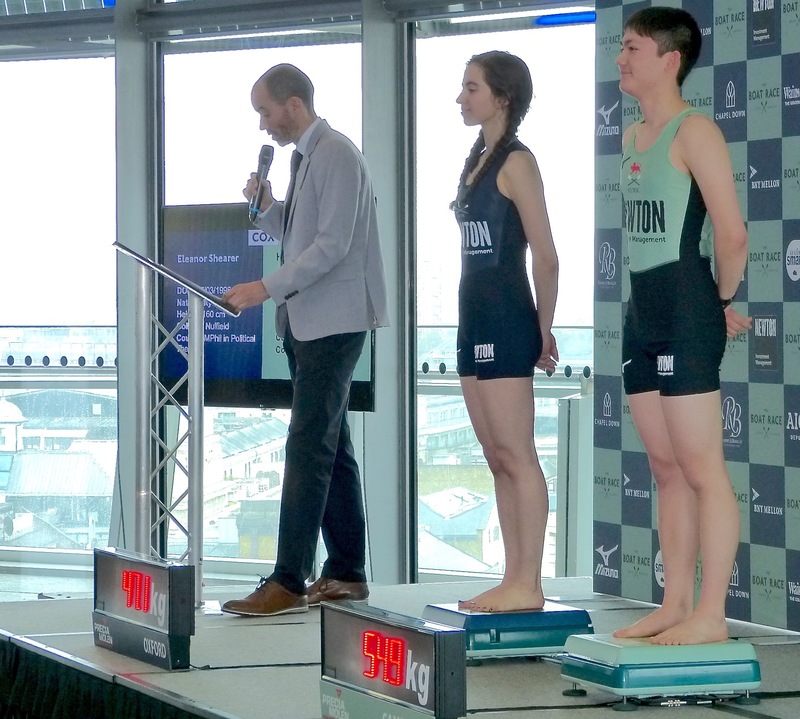 A further indignity is to wear it outside of a rowing context, say in a reception room in London’s City Hall. However, this was the fate of thirty-six otherwise lucky men and women on 14 March when the ritual humiliation known as the weigh-in and official crew announcement was made for the 2019 Oxford – Cambridge Boat Races. The Cambridge Women. As with all the formal crew pictures here, crew order is cox and stroke on the left, going through to bow on the right. An asterisk denotes a Blue. 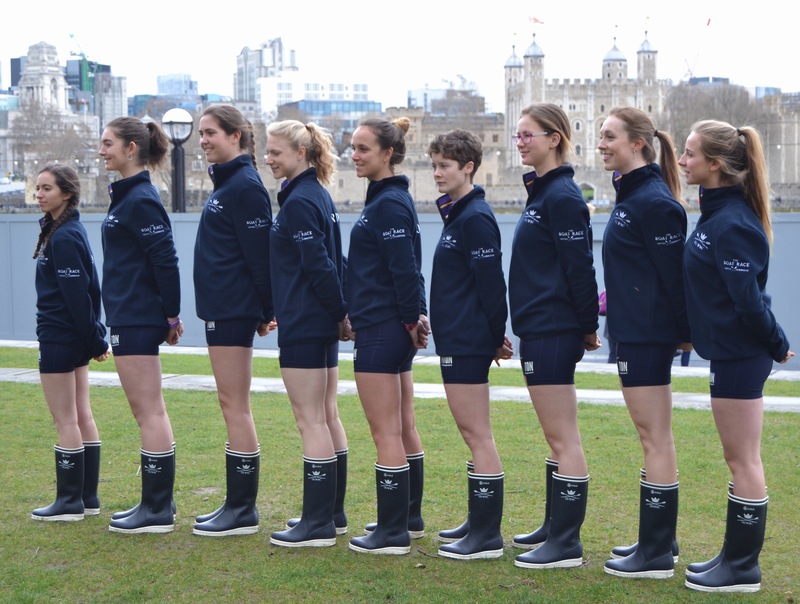 CUWBC: Name, nationality and degree. The Oxford Women. The score currently stands at 30 wins for them, 43 wins for their Cambridge rivals. The Cambridge Men. They lead the overall rankings, 83 to 80. The Oxford Men. Don’t smile for the camera. OUBC are mostly scientists. Is rowing an art or a science? The two stroke men weigh in. They are Augustin Wambersie of Belgium for Oxford and Natan Wegrzycki-Szymczyk of Poland for Cambridge. The bow women: Issy Dodds for Oxford, Tricia Smith for Cambridge. The women’s coxes: Eleanor Shearer for Oxford, Hugh Spaughton for Cambridge. 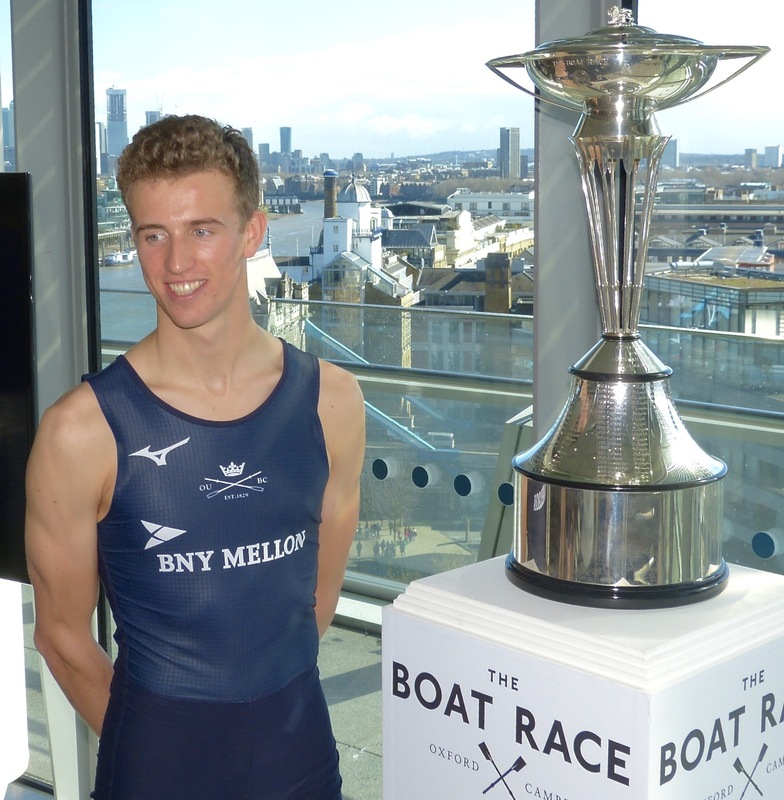 Felix Drinkall, ‘6’ and OUBC President, with the men’s trophy. Laura Foster, ‘3’ for Cambridge, with the women’s trophy. OUBC Coach, Sean Bowden, with some of his boys. The thirty-six who will battle it out on 7 April. These days, it is rare that the mainstream press reports on the weigh-in and crew announcement. However, this year they had a ‘human interest’ story that lead to wide coverage. 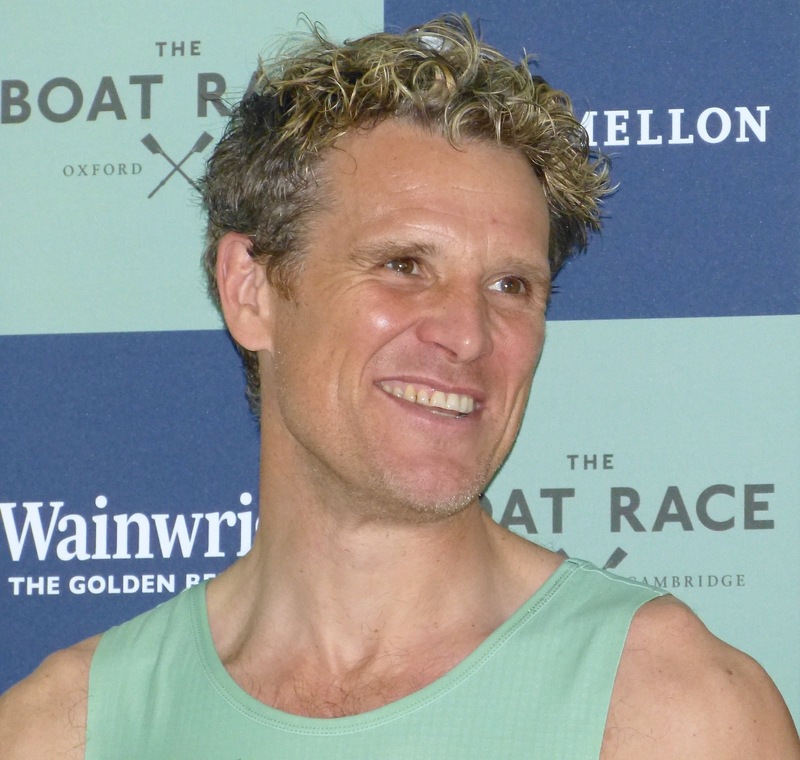 At the age of 46, James Cracknell has been picked for Cambridge’s ‘2’ seat. James is more than twice the age of his crewmates and older than some of their fathers. Cracknell, a six-time World Champion who also won Olympic Gold in Sydney in 2000 and in Athens in 2004, will become the oldest Blue by a huge margin (Mike Wherley was 36 when he rowed for Oxford in 2008) and will be the most decorated rower in the race’s history. 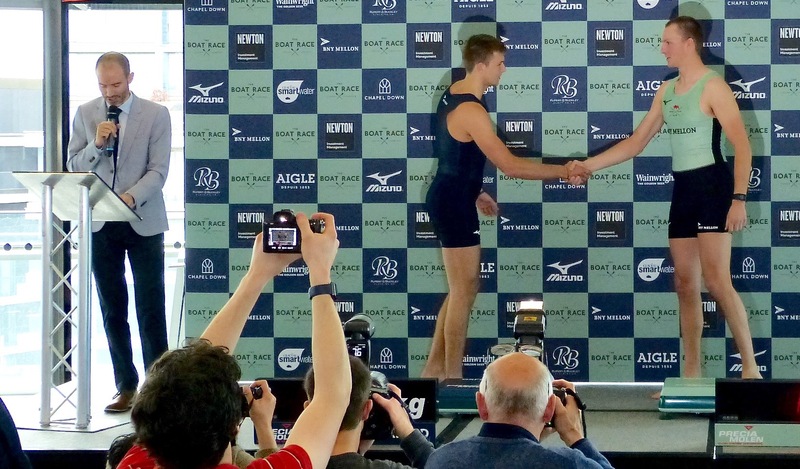 He is studying for an MPhil in Human Evolutionary Studies at Peterhouse, Cambridge, and has been trialling as part of the University Boat Club squad since September 2018, before the academic year started. 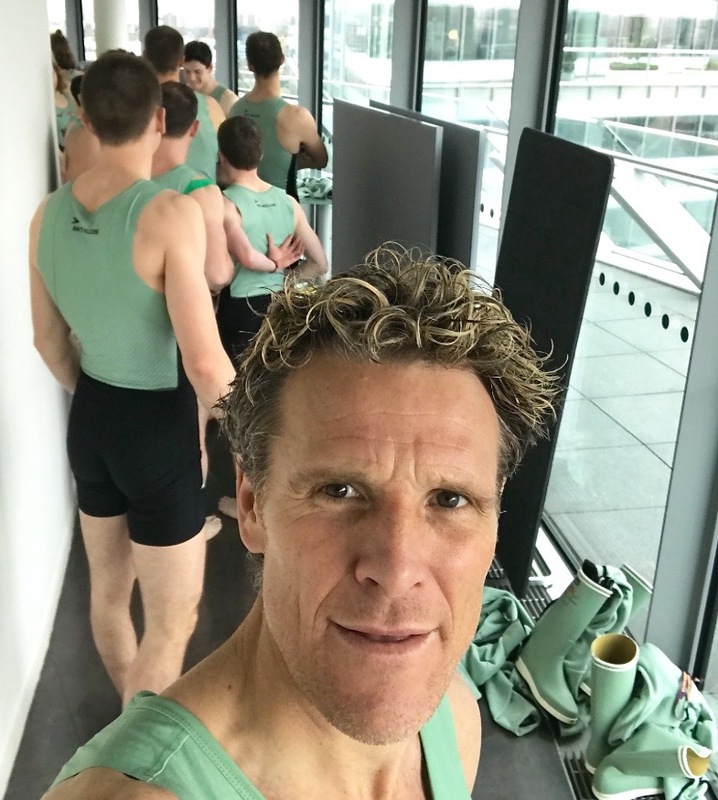 It’s impossible to appreciate what getting selected for The Boat Race is actually like. Training so intensively and competing with a group of guys for the same seats in a boat whilst studying hard at a top University, you could easily fall apart. The national team I was part of for so long could learn a thing or two from The Boat Race squads! After a tough year, making the Blue Boat is arguably my proudest achievement in rowing. But making the Boat is only the start, I and the other lads aren’t there for the kit and being selected, it’s about delivering on April 7th. Cracknell has been involved in various physical challenges since his retirement from rowing in 2004. He suffered a serious head injury in 2010 but ran the 2018 London Marathon in 2 hours 42 minutes. It has been a challenge…. I have struggled in ways I haven’t previously but you are also surrounded by people half your age and that makes you feel a lot younger…. The luxury of being a full-time athlete is you can plan your day around your training but here there is training and it is hard intensity but straightaway you are into lectures…. That has been a hard aspect to get used to. You are juggling strenuous academic requirements and then trying not to live like a student and still working like a student. 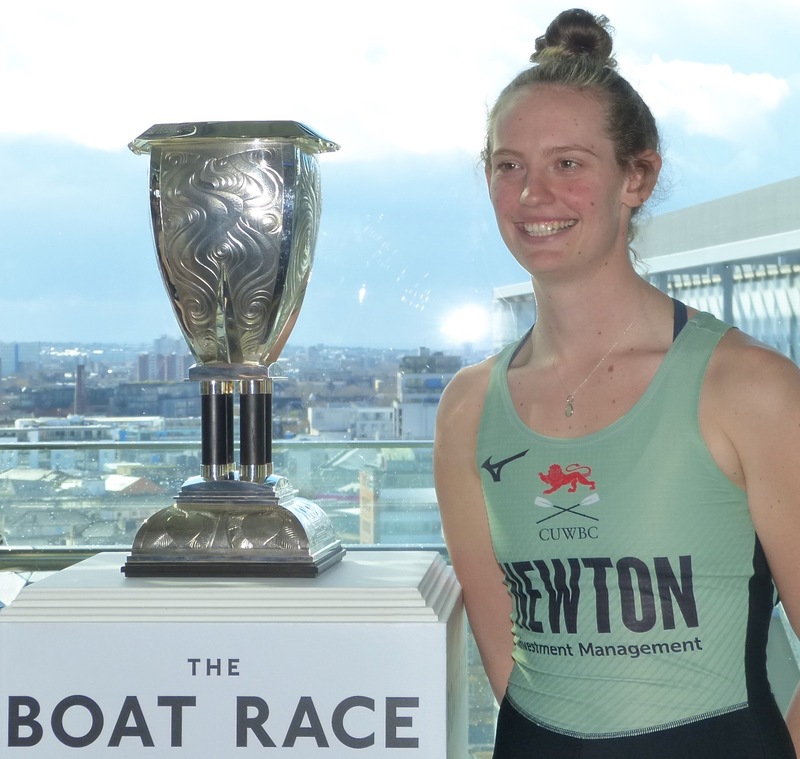 The Boat Race will take place on Sunday, 7 April 2019. 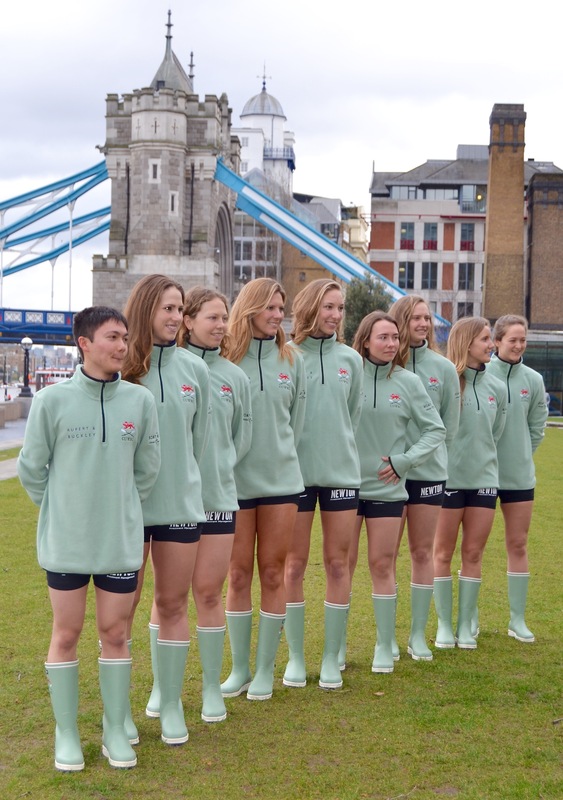 The Women’s Boat Race will start at 2:13 pm, and The Men’s Boat Race will be an hour later at 3:10 pm. Strange that an article about the ‘weigh in’ doesn’t mention either the weight or height of the individuals concerned. My father L.A.F. Stokes (Oxford President, 1951 and 1952) comments: Gosh, it’s all so much more commercialised since my day; and we wouldn’t have been seen dead in a skin-tight lycra. Yes, they are pretty huge compared with earlier times, and they all seem to be post-graduates – my crew was all undergraduates except one American. Bully for Cracknell, but I still hope he loses! Sorry, I forgot to mention that the rowers are tall and heavy, while the coxes are short and light. I’ll let you know if this changes. Specifically, Oxford men weighed in at 90.0kg average, Cambridge men at 89.8kg average. The average height per man for both crews is 194cm. 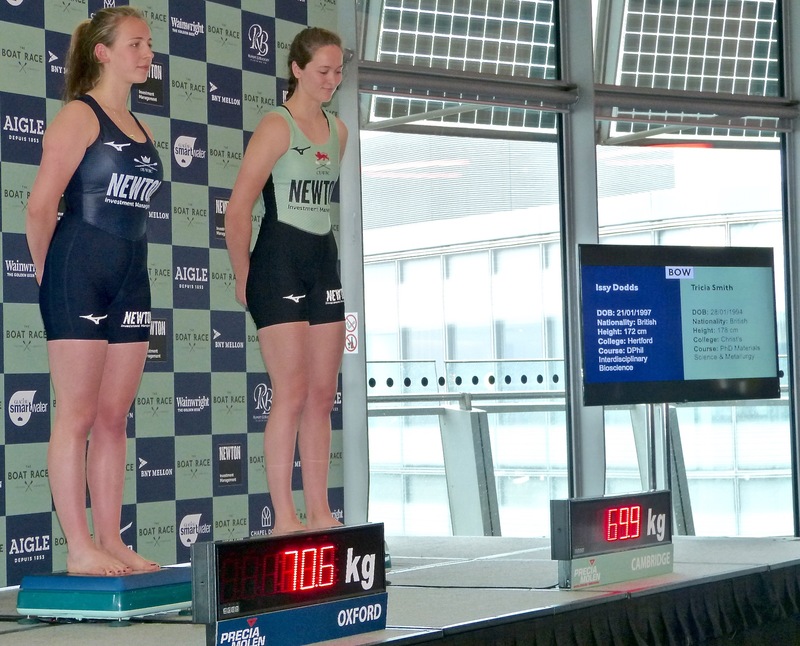 The average for the Cambridge women is 72.3kg, compared to Oxford at 71.1kg. The height difference is around 2cm per athlete, with an average height of Cambridge at 179cm per woman and Oxford at 177cm. Yes, it’s all very different 67 years on, but so is the world, the Universities of Oxford and Cambridge, the sport of rowing, and garment technology. The modern Boat Race(s) simply reflect this. In my view, all six have changed for the better.